According to Pono, the primary focus of their business operations has relationship marketing at the core. By serving customers they hope to build trust and loyalty, and through the developed relationship build unique marketing programs. In this interview, Pono shares one of his experiences as a volunteer on the committee that chaired the Ho’olaulea at Kamehameha Schools. One of their projects is a food drive for the poor. As Pono makes an inventory of their collection, he comes across a plastic bag, which contains a cup and a half of flour. Pono explains that this donation is probably the most important of all they have collected. The person who has donated it has probably given all or most of what he or she has. 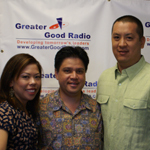 Greater Good Radio brings Pono Shim, entrepreneur and relationship marketing advocate, and his story about acceptance and invitation. Listen to this interview and hear more about his narration, which has been included in The Greater Good: Life Lessons from Hawaii’s Leaders. Pono Shim is the marketing executive and founder of Concierge Services at Ward. Son of Alvin Shim, labor law specialist and attorney, and mother Marion Heen Shim, daughter of Honolulu City Councilman, Ernest Nalani Heen Sr, and her brother Walter Heen, Pono credits his business acumen and sound value system to God and his amazing family mentored environment. Utilizing the current and constantly evolving email network, as a means of communication, products and services are developed in response to his network of membership-for-value business. Developing a reservation system for the largest cinema in the state, he expanded his membership services to include specials and discounts for his valued friends and network, from like-minded businesses who share his vision to provide the people of Hawaii products that are priced to accommodate the budgetary constraints of calling Hawaii their home. Hotel concierge services which were exclusive to the visitor, is now provided to the resident, through Concierge Services, with products that are designed and priced with the local consumer in mind. In response to the growing needs of this network, he met with neighboring businesses to learn about their products and services and collaborated on developing a value packed package with Ryan’s Grill & Bar, Dave & Buster’s, and Border’s Books, to name a few. His constant update of more products and services has stirred interest in this new advertising venue, by many resident consumer driven businesses and the membership-for-value business model standard is the focus of developing new partnerships. This model is fueled by his passion to improve the quality of life for the youth and future generations of Hawaii. Based on his standard of excellence philosophy, Pono has translated this to be service, loyalty and sensitivity, the characteristics that are inherent in the relationships he maintains. With his beliefs about the potential of the youth of Hawaii, he is building a business that would allow them to realize their opportunities for success, which are not limited by the educational and economic norms of today. This philosophy has him continually updating his business to include the fast growing technology and trends of today and educating and communicating these changes to his ever-increasing membership. He believes that with every technological advancement and loss of employment, there are enormous amounts of opportunities, and he struggles to maintain and communicate the service, loyalty and sensitivity in current and potential partnerships. What started as a way of “keeping in touch” with friends and family has grown into a database of over 10,000 long term and trusted relationships. It is this trust that he has translated into a business model, he hopes will grow to meet his vision of empowering the people of Hawaii with the confidence to meet and grow with the ever-changing new Hawaii, regardless of educational credited shortfalls. His belief in challenging the youth, to compete in the fast paced world of today, without losing the value and integrity based in the family unit, has him involved in an increasing list of speaking engagements. He is also the current President of Kamehameha School’s Association of Teachers and Parents. A founder of Pacific Wave Marketing LLC which is the IT Marketing Company which is licensed to developed Oceanic Time Warner Cable’s Kupa’a Program.